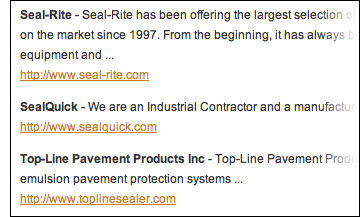 Listing your company in the Paveman Pro Industry Directory is an easy and effective way to create a greater awareness of your brand in the industry and drive potential customers to your website. There are 3 levels of listings for you to choose from: Premium, Featured and Basic. Below are instructions on how to activate the level of your choice. Click the "Create Your Basic Listing Now" link below to set up your basic listing, selecting the appropriate categories and options for your business. After you have completed the membership profile and selected the appropriate listing, click "Submit". Your submission will be reviewed and added to the Resource Directory! All information must be complete to be approved. 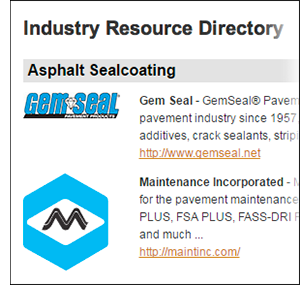 Once approved, you will be added to the Pavemanpro.com Industry Resource Directory. Basic listings are good for a lifetime. No renewal is necessary, and you will be able to update your information at any time. Featured listings display your logo, company description and link at the top of the appropriate "category" page. 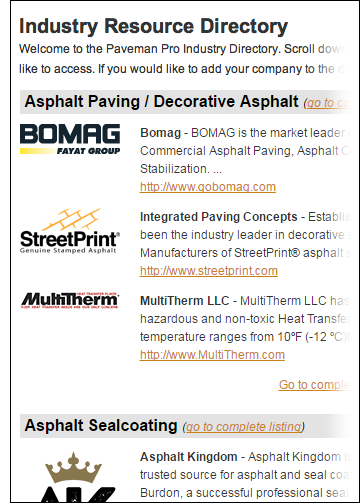 For example, if your asphalt paver company purchased a "Featured" listing, it would show up at the top of the "Asphalt Paving" category page ABOVE the "Basic" listings. Here's all you have to do to make that happen. STEP 2: Once completed, click on the submit button and you will be taken to a secure payment form where you will enter your payment details. As with the basic listing, your information will be reviewed and approved assuming all the information is complete. If it is not complete we will be in touch! Featured listings are good for one year. We will send you a series of emails towards the end of your annual term reminding you to renew your listing. If payment is not received before the renewal date, your companies listing will revert back to a basic listing. You will be able to update your information at any time. Be forewarned, this listing is for the big spenders. For a mere $200 you receive 365 days of "Premium" Paveman Pro red carpet treatment, with your listing on the "Industry Directory" landing page (page 1). This page is the first page visitors see when they click on any of the "Industry Directory" links on the site. From this page visitors select the category they want to view by scrolling to the appropriate section. Your company logo, description and link will be displayed along with the option to view the "complete listings" of the related category. Additionally, your listing will be shown along with the "Featured" listings on the specific category page. It's like getting two listings for one.
. Click on the submit button and you will be taken to a secure payment form where you will enter your payment details. Your information will be reviewed and approved assuming all the information is complete. If it is not complete we will be in touch! Premium listings are good for one year. We will send you a series of emails towards the end of your annual term reminding you to renew your listing. If payment is not received before the renewal date, your companies listing will revert back to a basic listing. You will be able to update your information at any time.